The Beauty Scoop: Wedding Season is Here! I seem to be at the age where everyone I know is getting married. Everyone. On top of that, it’s wedding season. Whether this makes you sigh heavily in despair or squeal in delight, here are a few tips for making the day(s) you spend at weddings as easy as possible! 1. Never stay in the same hotel as wedding events. This goes doubly for those of us who typically run late, those who are maybe less than social, those who value their sanity, etc. Granted, most weddings are organized to death, but sometimes, when you're more of a peripheral guest, all of said organization does not get fully communicated. This is understandable from the perspective of the bridal party. It is, however, no less awkward when you come traipsing into your hotel after traveling for twenty-six hours expecting to finally put your bags down, shower, maybe even sleep before all the coming excitement...and then. Then you see that the entire wedding party, plus guests, are enjoying cocktails (and have been for hours) in your hotel lobby. Oh, goodie! “Sorry, why was I not at the rehearsal dinner? Hahahahaha - um. What rehearsal dinner?! Hahaha, oh I smell like plane. Lovely.” All of which would have been avoidable if you had just stayed in a hotel down the road. In the meantime, freshen up with a few spritzes of GloMinerals Revive Hydration Mist to hydrate after your flight, throw on some mascara, and dust your cheeks with the Pur Minerals Marble Powder in Pink (it looks good on everyone, I promise). Even after traveling forever, these three go-to’s will convince everyone you’re human. Even you! 2. Go to the rehearsal dinner. 3. There is a better time to figure out the dress code than two hours before the wedding, when pictures are being taken. I don't know when, exactly, but there is a better time. At the very least, have the appropriate make-up with you. The Osmosis Eye Shadow Trios give you a bit of versatility to mix and match with your various clothing options while still being compact enough to throw in a make-up bag. The Pur Minerals Waterproof Mascara WILL NOT BUDGE, no matter how hot and sweaty you get outside waiting for the photographer. I mean, really, it won’t move. You might even have trouble getting it off that night (try this Osmosis Colour Melt Away Gelee, Make-up Remover), but at least you won’t have crazy, dripping mascara in those pictures. And speaking of pictures, you can have gorgeous, flawless skin that will last forever even if you maybe don’t have perfect skin in real life. gloMinerals Luxe Liquid Foundation is amazing and, when used in combination with the Luxe Setting Powder, is specifically designed to be flash-friendly. All of those pictures with all of that ‘diamond technology’ means you will look perfect. Forever. I’m not going to call it an optical illusion, but that’s exactly how it works, bending the light around imperfections to leave your skin looking smooth and glowing. Did I mention how amazing this stuff is? 4. You filled out the little online form and now you can legally officiate weddings! Don't. Not for a friend's wedding. Tell her you are honored she asked, then don't do it. Pay for a real officiant as her wedding present if you must, but don’t do it yourself. You know her too well and love her too much to want to be associated with this pressure-filled day. The same, obviously, does not go for the Maid of Honor position. There aren't any legal requirements for that one, and often there are fun perks! Like this gloMinerals Bridal Kit (I’m so jealous!). You can play up the perfectly prepared Maid of Honor role by carrying this with you, prepared to stop any and all make-up disasters. Alternatively, give this to the bride as a gift OR get one for each member of the bridal party. However you play it, this kit will be a life-saver. Shimmer, Perfecting Powder, Blotting Papers, gloss…this kit has everything to ensure that everyone stays lovely. 5. Do wear subtle indications of how you really feel. The key word here is SUBTLE. Think the marriage is a trap? Wear a tiny, tasteful gold handcuff necklace that you will be able to laugh off if noticed. In love with love and sure this will last forever? Wear your grandmother's wedding ring. There in support of another friend? Wear an accent in exactly the same shade as her dress. In all the flurry of photos, hugs, smiles and instructions, keep that little reminder that you're a person, too. It helps. 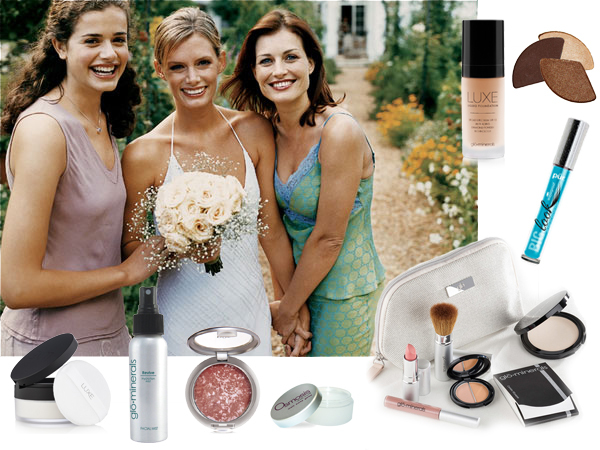 Tell us what you couldn’t live without on your wedding day or what beauty products have helped you survive this wedding season - email us at customerservice@beautystoredepot.com!